Join Us!!! We are looking for someone to help us cover Uruguayan basketball. Please send us an e-mail. Panteras de Aguascalientes (LNBP) added to their roster 28-year old American power forward Tony Criswell (205-109kg-91, college: Missouri). He played last summer at Atletico Tabare in Uruguayan Metropolitan. Criswell managed to play in three leagues in two countries last year. In 7 Metropolitan games he recorded very impressive stats: 25.6ppg, 7.3rpg and 1.0apg. The most of last season he spent at Villa Mitre (TNA) in league where in 16 games he averaged remarkable 19.8ppg, 9.3rpg and 1.1spg. Criswell also played for Obras Basket (LigaA) in league. In 14 games he had 6.0ppg and 3.6rpg. He has played previously professionally in Canada (London Lightning and Halifax Hurricanes) and Germany (MLP Academics Heidelberg). Criswell attended University of Missouri until 2014 and it will be his fifth season as a professional player. Defending champion Malvin Montevideo (LUB) landed 31-year old American ex-international guard Elijah Millsap (198-98kg-87, college: UAB). He started the season at Breogan in Spanish Liga Endesa. In 11 games he averaged 7.0ppg and 1.9rpg this season. The most of last season Millsap spent at the Wolves in NBA where in 45 games he had very impressive stats: 15.1ppg, 5.3rpg, 2.3apg and 1.5spg. He also spent pre-season at the Suns in NBA. Among other achievements Millsap's team was regular season runner-up in PBA Governor's Cup in 2016. He received also Asia-Basket.com All-PBA Governor's Cup Guard of the Year award back in 2013. Millsap was a member of USA Senior National Team two years ago. He is a very experienced player. And here thanks to pro basketball Millsap experienced life in five different countries playing on three different continents. He is familiar with European, Asian and of course North American leagues. Millsap has played previously professionally in China, Israel (Maccabi Fox Tel-Aviv), Philippines (SM Beermen), NBA (Utah Jazz and LA Lakers) and NBA G League (NAZ Suns). He attended University of Alabama at Birmingham until 2010 and it is his ninth season in pro basketball. Here is the weekly review of the top performing Uruguayan players, who play currently abroad. #1. This week's number one is an international power forward Mathias Calfani (204-92, agency: Pro Sports, currently plays in Argentina). 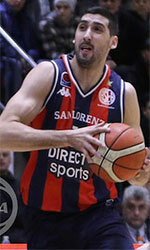 He could not help San Lorenzo (22-3) in their last game. Despite Calfani's good performance the league leader San Lorenzo was badly defeated 91-71 on the road by the lower-ranked (#7) Gimnasia. He was the second best scorer with 12 points. Calfani also added 4 rebounds and 3 assists in 24 minutes on the court. This year Calfani averages: 8.4ppg, 6.2rpg, 1.9apg, 1.1bpg, 2FGP: 63.0%(46-73), 3FGP: 42.4% and FT: 56.7% in 23 games he played so far. He is currently a member of the Uruguayan senior national team. #2. Second place goes to an international point guard Bruno Fitipaldo (183-91, also represented by Pro Sports, currently plays in Spain). Fitipaldo was not able to help Burgos (12-15) in their last game on Sunday. Despite his good performance Burgos was edged 88-85 in Badalona by the higher-ranked Joventut (#7). Fitipaldo was the top scorer with 14 points. He also added 3 assists. Fitipaldo's overall stats this season are: 8.1ppg, 1.8rpg, 4.6apg, 2FGP: 52.2%, 3FGP: 35.9% and FT: 77.4%. He is in the roster of the Uruguayan senior national team. #3. The Uruguayan player who performed third best last week abroad was an international point guard Luciano Parodi (182-94, currently plays in Brazil). Parodi led Corinthians to a victory against the tenth-ranked Brasilia (10-16) 83-74 in the Brazilian NBB on Saturday night. He scored 13 points, had 4 boards, passed 9 assists and added 4 steals in 36 minutes. Sport Club Corinthians Paulista (3-7) is placed fourth in the NBB. Parodi has relatively good stats this year: 14.1ppg, 3.3rpg, 6.6apg, 2.2spg, 2FGP: 51.5%, 3FGP: 38.0% and FT: 88.6% in 18 games. He is also a member of the Uruguayan senior national team. #4. Guard Diego Garcia (183-92, currently plays in Argentina) contributed to an Hispano Americano de Rio Gallegos' surprising victory against the third-ranked Ferro (20-10) 90-73 in the Argentinian La Liga in Wednesday night's game. Garcia recorded 9 points and added 4 passes. Hispano Americano de Rio Gallegos (11-15) is placed 14th in the La Liga. It's Garcia's first season with the team. Garcia's overall stats this year are: 4.4ppg, 2.2rpg and 2.7apg. He is also Uruguayan national team player. #5. Former international forward Maximiliano Sole (197-88, currently plays in Spain) led Real Madrid II to a victory over the 15th-ranked Liceo Frances (6-20) crushing them 111-76 in a derby game in the Spanish EBA (fourth division) last Sunday. Sole was MVP of the game. He had a triple-double by scoring 24 points, grabbing 10 rebounds and passing 11 assists in 26 minutes. Real Madrid II (22-5) is placed second in Group B. It was his team's fifth consecutive victory in a row. There are only three games left until the end of the Regular Season. So now every game will be critical. This year Sole's overall stats are: 5.2ppg, 4.0rpg and 1.7apg in 21 games. He has a dual citizenship: Uruguayan and Greek. Sole used to play for the Uruguayan national team four years ago. #6. Point guard Santiago Vidal (180-89, another player represented by Pro Sports, currently plays in Spain) was the main contributor in Ourense's victory against the 19th-ranked Caceres Basket (5-20) 83-80 in the Spanish LEB Gold (second division) on Friday night. He was the best player in that game. Vidal recorded 15 points, 6 assists and 4 steals. Rio Ourense Termal (19-12) is placed fifth in the LEB Gold. There are only three games left until the end of the Regular Season. So now every game is very crucial. Vidal's total stats this season are: 7.4ppg, 3.6rpg, 5.7apg and 1.6spg. He is an international player who is currently on the senior Uruguayan National Team roster. #7. U21 international shooting guard Bernardo Barrera (194-97, currently plays in Argentina) faced previously mentioned Mathias Calfani in the Argentinian La Liga last game. Barrera managed to help Gimnasia y Esgrima Comodoro Rivadavia in a victory against the league leader San Lorenzo (22-3) crushing them 91-71. He recorded only 2 points in 3 minutes on the court. This year Barrera averages just 2.5ppg in four games. He is also Uruguayan U21 national team player. #8. An experienced small forward Mauricio Aguiar (199-83, another player represented by Pro Sports, currently plays in Brazil) is a teammate of previously mentioned Luciano Parodi. But that was another game of his team in Brazilian NBB which we would like to mention. Aguiar was not able to secure a victory for Corinthians (3-7) in their game against Flamengo (22-4). He recorded 5 points. Corinthians was badly defeated 92-73 at home by the leading Flamengo. Aguiar's total stats this season are: 6.5ppg and 1.1rpg. He used to play for the Uruguayan national team back in 2016. #9. Former U17 international center Rogelio De Leon (205-89, currently plays in Argentina) couldn't help Rocamora (3-3) in their game against Racing Chivilcoy (16-10) in the Argentinian La Liga Argentina (second division). De Leon recorded 7 points and grabbed 7 rebounds in 19 minutes. The third-placed Rocamora (3-3) lost 59-72 on their home court in Rocamora to the much lower-ranked (#12) Racing Chivilcoy in the South group. There are only three games left until the end of the Regular Season. This year De Leon's total stats are: 7.5ppg, 5.2rpg and 1.2bpg in 15 games. He used to play for the Uruguayan U17 national team fourteen years ago. #10. Forward Matias Guerra (201-92, currently plays in Spain) couldn't help Palma II (10-15) in their game against SESE (12-14) in the Spanish EBA (fourth division). Despite his very good performance on Saturday night Guerra was the top scorer with 18 points. He also added 7 rebounds. Guerra's team will play only one more game in the Regular Season. This season Guerra has relatively solid stats: 11.3ppg, 8.0rpg and 1.3apg. He is a former U18 international player as nine years ago he still played for the Uruguayan national team. #11. Former U18 international small forward Rodrigo Deus (196-97, currently plays in Spain) contributed to Cazorla's victory against the 12th-ranked ULB OH!TELS 81-73 in the Spanish EBA (fourth division) in Friday night's game. Deus scored 10 points and grabbed 5 rebounds in only 9 minutes. Deus has averaged so far 4.7ppg and 3.3rpg in 26 games. He used to play for the Uruguayan U18 national team five years ago. #1. Emiliano Giano (180-PG-89, currently plays in Spain) contributed to Navarra's victory against the seventh-ranked Girona Basquet (15-15) 90-81 in the Spanish LEB Silver (third division) last Saturday. Giano scored 9 points. Basket Navarra (20-10) is placed first in West group. There are only four games left until the end of the Regular Season. So now every game will be critical. Giano's total stats this season are: 3.4ppg and 1.1rpg. He has a dual citizenship: Italian and Uruguayan. #2. Agustin Zuvich (201-F/C-95, currently plays in Argentina) could not help Gimnasia LP (11-15) in their last game. Despite Zuvich's good performance the sixth-placed Gimnasia LP (11-15) was edged 75-72 at home by the higher-ranked (#4) Deportivo Viedma in the South group. He had a double-double by scoring 11 points and getting 10 rebounds in 22 minutes. There are only three games left until the end of the Regular Season. So now every game is very crucial. This year Zuvich has relatively solid stats: 10.7ppg, 8.2rpg, 1.4apg and 1.1spg in 39 games he played so far. He is another player who holds two passports: Argentinian and Uruguayan. Malvin topped Bigua to reach the semifinal stage. Malvin made 23-of-28 charity shots (82.1 percent) during the game. American forward Shawn Glover (201-90, college: ORU, agency: Haylett Sports) orchestrated the victory by scoring 22 points and 7 rebounds. Naturalized Italian guard Nicolas Mazzarino (184-75) contributed with 13 points, 6 rebounds and 8 assists for the winners. Four Malvin players scored in double figures. American guard Charles Hinkle (198-88, college: American) answered with 23 points and American Storm Warren (201-88, college: LSU) added 12 points, 8 rebounds and 4 assists in the effort for Bigua. The winner was already known earlier in the game, so both coaches allowed to play the bench players saving starting five for next games. Nacional cruised past Olimpia en route to the semifinal berth. Nacional outrebounded Olimpia 39-27 including 32 on the defensive glass. They shot the lights out from three sinking 13 long-distance shots on high 56.5 percentage. Great defensive blocking was one of the keys in this match when Nacional made 7 blocks. The best player for the winners was American forward Anthony Danridge (196-86, college: N.Mexico) who scored 26 points and 5 rebounds. Naturalized Spanish center Esteban Batista (208-83, agency: Duran International) chipped in 6 points, 15 rebounds and 4 assists. American forward John Dickson (198-90, college: Sacramento St.) produced 22 points and naturalized American Reque Newsome (204-81, college: S.Indiana, agency: Pro Sports) added 13 points respectively for the guests. Urunday University shocked Trouville on the road to seal the semifinal appearance. Urunday Univ. made 24-of-27 free shots (88.9 percent) during the game. Urunday Univ. outrebounded Trouville 37-26 including a 27-16 advantage in defensive rebounds. American guard Kyle Lamonte (191-84, college: William Carey) stepped up and scored 21 points, 6 rebounds and 4 assists for the winners and his fellow American import power forward Chaz Crawford (207-84, college: Drexel) chipped in 14 points and 14 rebounds. Lamonte is a former Eurobasket Summer League player, which is considered top international summer league in the market. Naturalized Italian point guard Marcos Marotta (180-89) responded with 15 points and forward Nicolas Catala (200-91) scored 13 points.